Espresso Terra Bites are dark chocolate espresso beans with medicinal marijuana in them. What’s more to say? I already knew that California-based Kiva Confections creates great tasting and potent edibles. These espresso bites are high-quality with the same look and taste as other high-end candy espresso beans. As far as edibles go, they are quite delicious, and also have effective medicinal properties. The company takes pride in their products, and the small snacks are no exception. They’re an absolutely delicious combination of roasted Tanzanian coffee beans and smooth dark chocolate. Best part? You can get them at a discount through GreenRush Delivery with our Kiva Edible Promo Code HAPPY80. If you are like me, you can’t walk past the Trader Joe’s cash register without getting a tub of the espresso beaned covered in chocolate. 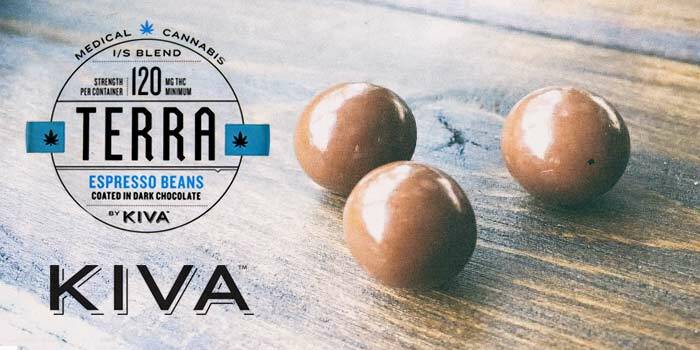 So when I discovered the Kiva Espresso Terra Bites that featured the extra ingredient of cannabis, I died and thought I had gone to heaven. I found them through GreenRush, a weed delivery service that I’d used in the past for other medical marijuana products. If you’re new to GreenRush, you can use the promo code HAPPY80 for a whopping $80 off. If you’re an existing user, use the code HAPPY15 for $15 off! So this time through GreenRush I took a chance on Kiva espresso terra bites, and I wasn’t disappointed! You should keep in mind as you take these that THC affects everyone differently. If you’re more sensitive to marijuana, it’s best to take these slow at first, with a small dose, especially if you’ve never tried edibles before. The helpful insert that comes with these espresso bites recommends that you start with a small dose, and wait up to two hours to see effects. Even though they are small, they pack a bit of a punch. At 5mg per piece, it’s easy for you to carefully control your dosage, and find the dose that’s right for you. I am a moderate marijuana user so I ate a little under the recommended dose. It was amazing, I had a relaxed and comfortable night chatting with my roommate. The caffeine from the espresso beans might also have an effect on you, if you’re more sensitive to caffeine. I recommend experimenting a bit to find just the right amount for you and your body. Overall, Kiva Espresso Terra Bites are a great product. They’re as delicious as they are effective, and getting your medicinal marijuana dose is simple and enjoyable. You will find real results from these espresso bites, and with such a controlled amount per piece you can easily measure out the proper dose. They are made of high-quality ingredients, and with care. You can trust what you’re putting into your body is safe and effective. 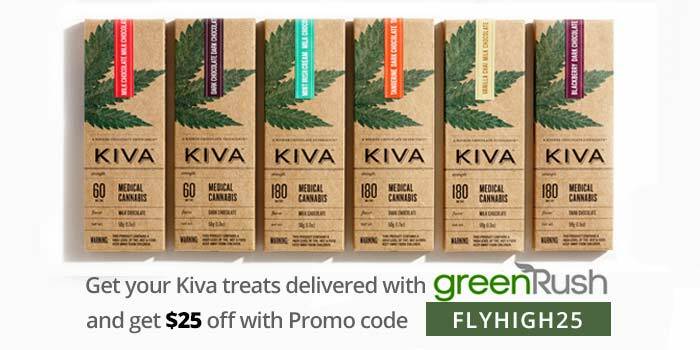 I ordered mine through GreenRush Weed Delivery and was able to use my Kiva Edibles Promo Code for GreenRush HAPPY80 for $80 off my first few GreenRush orders. Pingback: GreenRush Coupon Codes: Our GreenRush Promo codes get $80 OFF!